Blessing ceremony at the Lower Brule Reservation. 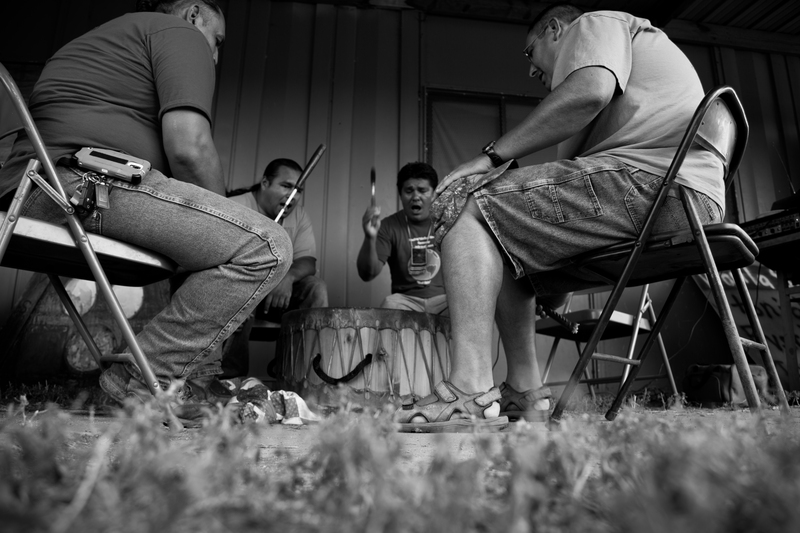 Kul Wicasa Warriors drumming during the August 23rd gathering at the Lower Brule Reservation. 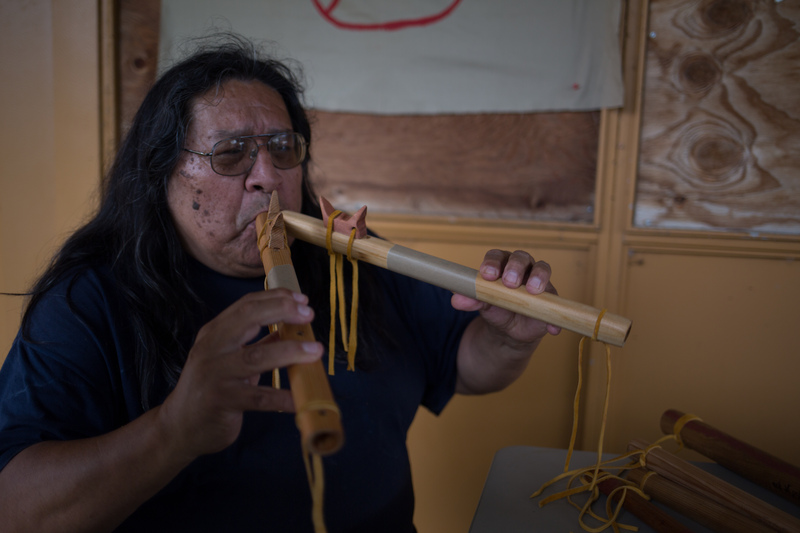 Lakota George is twice the flute player as the average person. 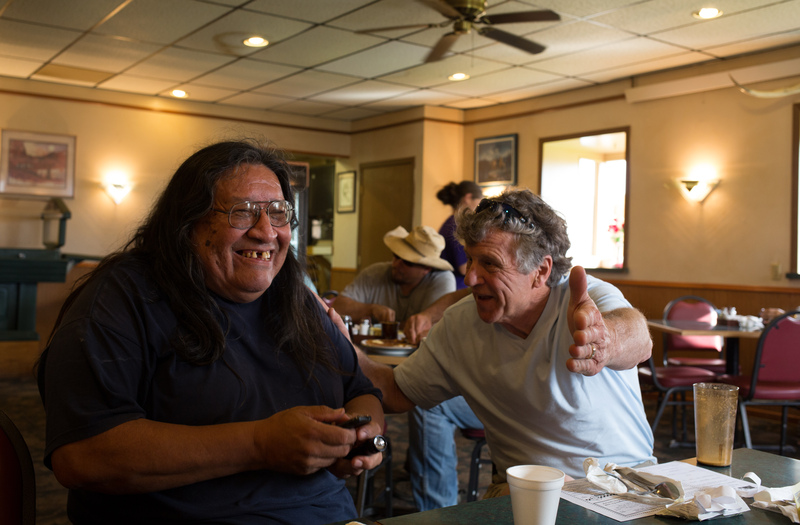 Lakota George, of the Kul Wicasa Oyate, and Kurt Russo, a longtime Lummi Nation supporter, laugh about the “Things Not to Say to an Indian on Your Vacation” book idea. But humor gave way to a sacred ceremony and the thoughts of the members of the tribe on their plight, and their fight, against the Keystone Pipeline~the “black snake.” A young woman spoke of her dream in which the snake was approaching from the north, consuming the water, killing all life, and making the people ill. Standing against the snake first were the women, then the men, then the traditional leaders, and behind them the children. Those who were made sick were being passed back to be healed. 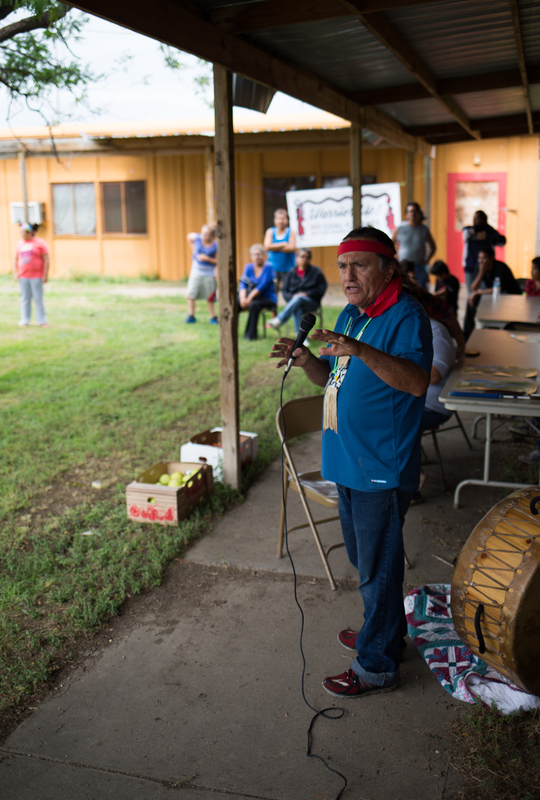 During the gathering, Indigenous people from around the region shared words about their struggles against colonial energy projects being permitted on ancestral lands without their consent. Kul Wicasa Warrior speaking from the heart. Despite the challenges, the tribal members attending the blessing ceremony left no doubt that they, and most of their community who understand the issue, firmly oppose the pipeline proposal that would devastate and denature their homeland. Their passion and spiritual connection to the water was evident in the ceremony down on the Missouri River (“muddy water”). The Kul Wicasa tribal people and the Lummi stood in the waters of the Missouri as the prayers were offered and water was gathered for the travelers to take on their journey to eventually place in the Salish Sea. 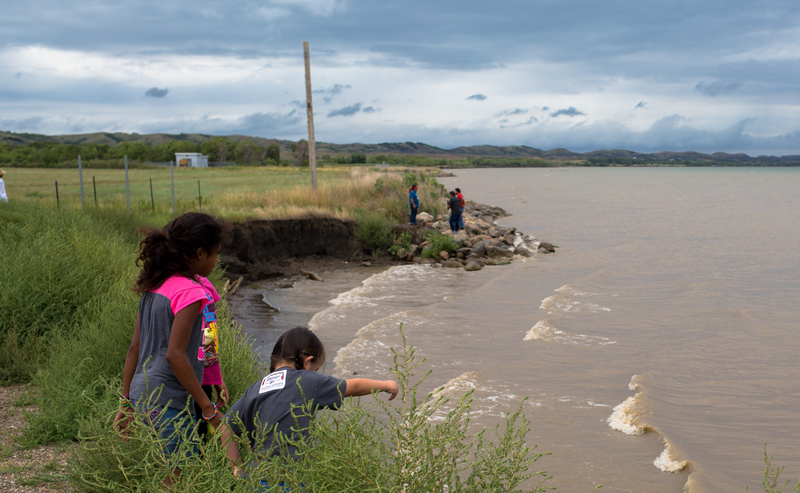 Youth play on the banks of a hydroelectric dam reservoir on the Missouri river after the water blessing ceremony. Just like the 1952 Ft. Randall dam in Ihanktonwan territory to the West, huge swaths of Indigenous lands were obliterated here by the Big Bend dam construction completion in 1963. Returning to the site of the ceremony the lead speaker asked that all those assembled join in a prayer for the land, the water, the people and all our relations, and that the pipeline be defeated. “You can use any words you want to use, in any way you choose,” he said. As the prayer and the round drum invoked this ceremony, the sun broke through the clouds over the ceremonial grounds. After the prayer a Kul Wicasa person told of a vision of a battlefield. During the battle the field was suddenly illuminated and the warrior woke up to the light to see more clearly and deeply the way to success and victory. “They have profits,” another tribal speaker said, “but we have prophecies.” The passionate words of the young Sioux woman warrior at the end of the day spoke to the spirit of defeating the “black snake” and corporate injustices, of uniting the tribes and their non-Indian friends and neighbors, and setting the stage for a new era in our shared responsibilities to the land, to each other, and to the Creator. 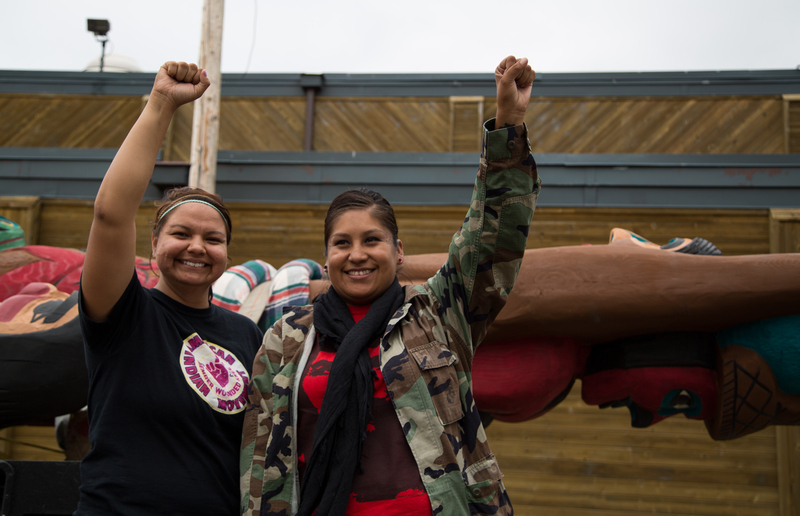 Wanikiya win Loud Hawk of the Wakpa Waste Oyanke, on the right, was arrested by her tribal police this July after putting her life on the line and blocking pipeline equipment from moving across her traditional lands. 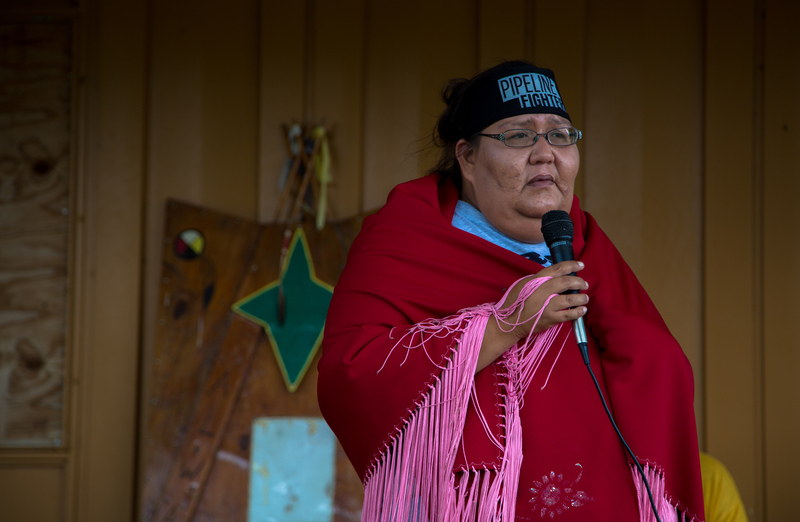 Even though Wanikiya was only carrying out her responsibility to protect sacred water, seven charges were thrown at her. 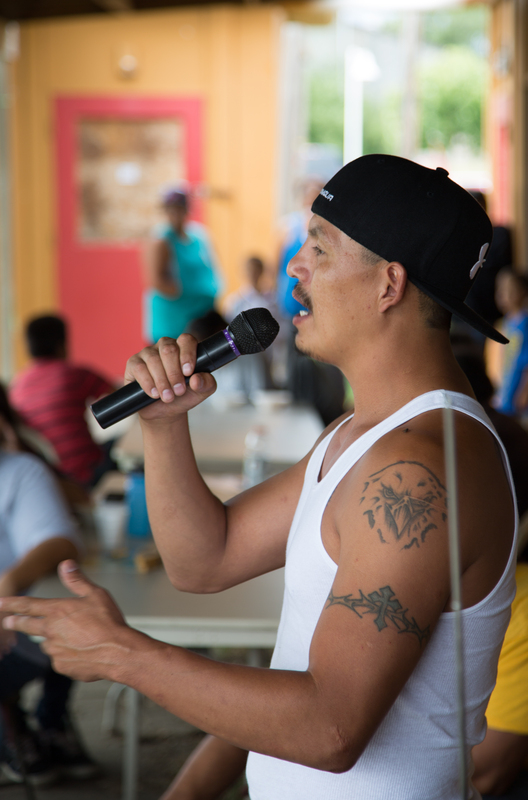 The trial is on October 14th in the Cheyenne River Reservation, and support is welcome. There was no question that this grassroots movement in this part of Sioux Territory would secure victory. Their passion, their understanding that others stand beside them, their humility, pride in their heritage, and great love of their homeland would guide and protect them. Jewell James let them know that the Lummi stand beside them, reading a letter from Timothy Ballew, the Chairman of the Lummi Nation. “Our commitment to place, to each other, unites us as one people, one voice to call out to others who understand that our shared responsibility is to leave a better, more bountiful world for those who follow,” the Chairman wrote in his letter.